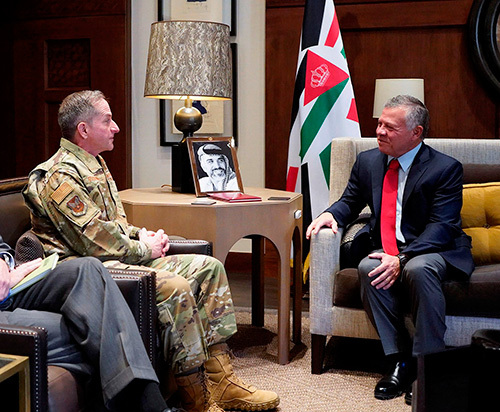 His Majesty King Abdullah II of Jordan received at al-Husseiniya Palace on Wednesday the US Air Force Chief-of-Staff David Goldfin for a meeting in which they discussed prospects of military cooperation between the two countries. The meeting, which was attended by His Royal Highness Prince Faisal Bin Al Hussein, dealt with the efforts of the war on terrorism as part of a holistic strategy, according to Petra News Agency. Commander of the Royal Air Force and the Chargé d’Affaires of the American Embassy in Amman attended the meeting. King Abdullah also received on Wednesday Iraqi Deputy Prime Minister and Finance Minister Fuad Hussein, at Al Husseiniya Palace. At the meeting, King Abdullah stressed the strong ties between the two countries and the importance of developing them in various fields. Discussions focused on opportunities to expand cooperation between Jordan and Iraq, especially in economy, trade, and investment, as well as the energy and transport sectors. His Majesty praised the success of the political process in Iraq, reaffirming Jordan’s commitment to supporting the security and stability of Iraq. For his part, Deputy Prime Minister Hussein reiterated his country’s appreciation for Jordan’s role, under the leadership of the King, in supporting Iraq, expressing keenness to expand economic and trade cooperation with the Kingdom. Adviser to His Majesty and Director of the Office of His Majesty Manar Dabbas, Adviser to His Majesty for Economic Affairs Mohamad Ississ, Finance Minister Ezzedine Kanakrieh, and Iraqi Ambassador to Jordan Safia Al Suhail attended the meeting.